Featuring Merino wool, the 2XU Thermal Compression Sock incorporates wool for greater warmth and thermoregulation, padded zones for comfort and arch positioning to provide maximum support. 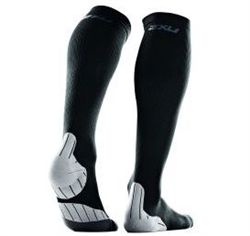 The 2XU Thermal Compression Sock incorporates wool for greater warmth and thermoregulation. Strategically designed with padded zones and arch positioning to provide maximum support for the foot. An ideal Compression Sock for colder climates. Powerful compression throughout to support lower leg muscles with gradient pressure to promote enhanced circulation for greater warm up and recovery. Fabric Content: 40% Polyacryl / 28% Nylon / 23% Elastane / 9% Merino Wool. I highly recommend these socks for winter running. The combination of compression and warmth are top notch. Never thought I needed compression socks before, but just to protect a recovering injury I got these and I love how snug they kept my calf. Back to TriBoutique for more of these goodies!